Our Printing Thermo-Hygrometer is ideal for both monitoring and providing a permanent printed record of relative humidity and temperature with time-of-day/month stamp. Sampling rates of 1 minute to 100 hours can be set. 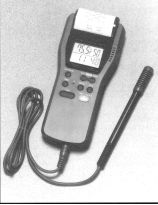 Triple Display with half-inch high digits continuously and simultaneously shows relative humidity, temperature and time. Min/Max memory function stores and recalls highest and lowest readings. The printing thermo-hygrometer is supplied with 4 AA batteries, lithium battery, paper roll, probe holder/stand and carrying case. This unit is sold in either a °F or °C version. This unit does not switch from °F to °C, you must choose either Fahrenheit or Celsius readout at time of purchase. The printing paper refill rolls are sold in packs of 6 rolls.